At that time I should have decided to do what IGN did in September of 2004, launch Direct2Drive and sell games online. I talked with Sutton Trout Director of Digital Content and Consumer Products for Direct2drive yesterday, and he put it simple enough for grandma to comprehend. 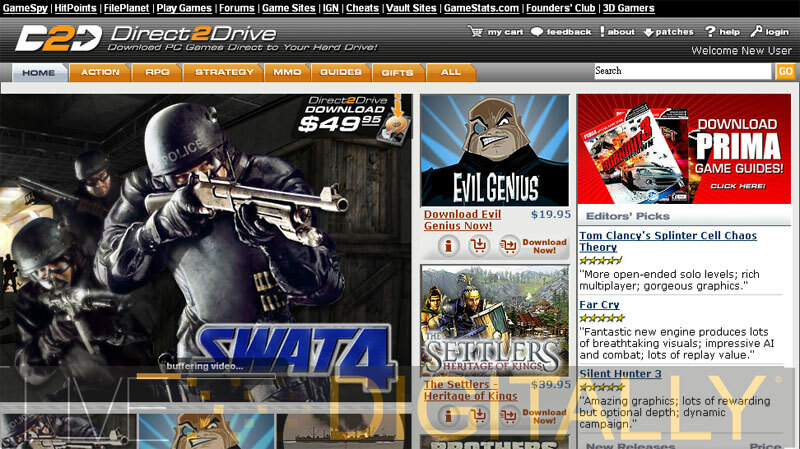 Direct2Drive is a website that allows you to purchase full versions of games fit to play on your PC. The games are purchased via credit card through a secure web server and then with IGN’s proprietary download manager, the game you purchased is sent ‘directly to your hard drive’ (that’s why they’re named what they’re named). This isn’t small pickin’s we’re talking here. 150,000 people visit Direct2Drive a week which, in itself is only a fraction of the entire IGN blanket, totaling 30+ Million registered users. Within the next few weeks I will be running my keyboard and mouse over the Direct2Drive service, while letting you know just how it goes. Stay tuned for more on the newest thing to hit video games since the concept of nickel arcades! « Happy Birthday Old Friend.